We are all aware of the environmental impact of the fashion industry, but what we don’t know is that 26% of it happens after you have bought a garment. The use of resources such as water and energy to wash, dry and iron our clothes are an important part of a garment lifecycle, thus its environmental impact. Buy less and make it last! We recommend washing by hand in cold water or 30° C maximum. No chlorine. Organic cotton is not treated therefore in high heat it may shrink more than 10% so do not tumble dry. No professional dry-cleaning. We do not recommend traditional machine wash. Organic cotton is not exposed to the weakening, harsh chemicals that commercially grown cotton is, therefore powerful detergents, full of abrasive chemicals that are hard on delicate undyed fiber, not to mention the environment and you, is not recommended to wash our garments. Use a soft detergent, or - even better - a homemade one ! Never hang up your wet knitted clothes, let them dry flat on a towel so that they regain their original shape. Iron to a maximum iron sole temperature of 110° C.
To store your sweaters, it is advisable to fold them so they keep their shape. Knitted garments must not be hanged because the piece could lose its shape. Fold them and store them in a space with a moth-repeller. Nothing lasts forever, but most things can last a long time if you take good care of them. Clothes are no exception. A snag, hole or tear in your jumper can happen but can also be easily repaired! That's why we add an extra piece of cotton so that you can use it to repair your precious sweater or beloved cardigan. We recommend washing by hand in cold water or 30° C maximum. No chlorine. Do not tumble dry. No professional dry-cleaning. We do not recommend traditional machine wash. Never hang up your wet woolen clothes, let them dry flat on a towel so that they regain their original shape. Iron to a maximum iron sole temperature of 110° C.
Think about the planet! Make sure your clothes really need to be washed. Unlike synthetic fabrics, wool does not need to be washed often. Just air your clothes after wearing them. 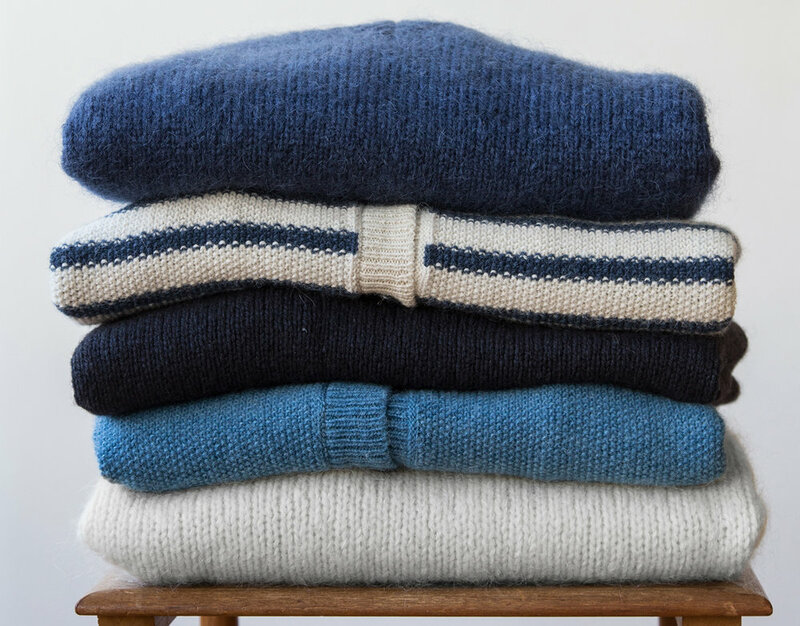 To store your sweaters, it is advisable to fold them so they keep their shape. Woolen garments must not be hanged because the wool could lose its shape. Fold them and store them in a space with a moth-repeller. Nothing lasts forever, but most things can last a long time if you take good care of them. Clothes are no exception. A snag, hole or tear in your jumper can happen but can also be easily repaired! That's why we add an extra piece of wool so that you can use it to repair your precious sweater or beloved cardigan. Shave your knit! You can use a razor to shave the pilling: on a flat surface, take your razor and GENTLY run it along your fabric in the direction of the weave. It will remove the pills without damaging the garment. Do it slowly and carefully. Always wash garments inside out to protect all buttons from regular abuse. The buttons will last for years with this simple precautionary measure.